I asked my daughter if she has been to The Lazy Dog Restaurant. She replied ‘I love that restaurant!’. Why am I not surprised? My daughter is quite a foodie herself. She probably has dined at more restaurants than I have. Allen and I recently came to check out the new Spring menu. When I walked into the restaurant, It was like I had gone to a mountain lodge. For the next 2 hours, I felt like I was vacationing somewhere enjoying a relaxing time. And you know why? It was because the restaurant was established with that goal in mind. Founder of the restaurant, Chris, wanted the guest to come and enjoy life as much as a lazy dog by the camp fire. (To read more of the story how the name Lazy Dog came from, click here). I had an good conversation with the General Manager, Mike. 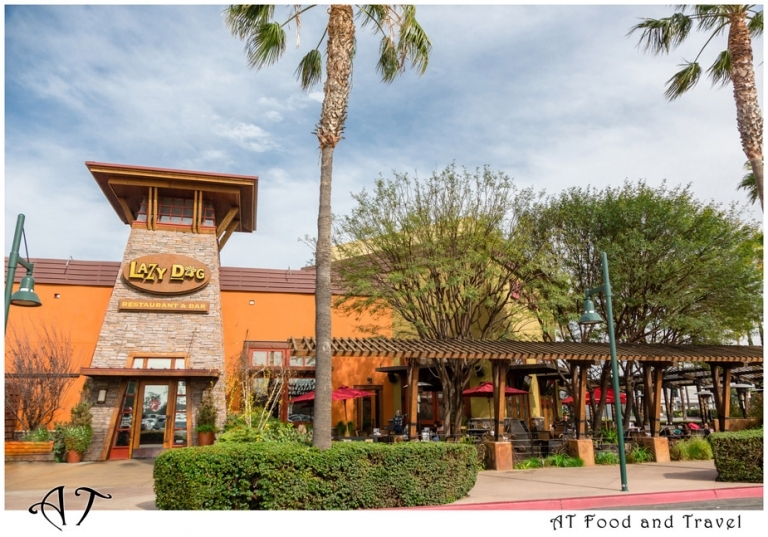 I was not only impressed with the food and service but also the culture at The Lazy Dog Restaurant. Mike told me he started as a server and worked his way to a GM. The company really value their employees and provide them with growth opportunities. It’s no wonder everyone working here is so happy and friendly! We started with some refreshing drinks. I am a huge fan of lemonade. I was so excited to see so many different lemonade drinks on the menu! 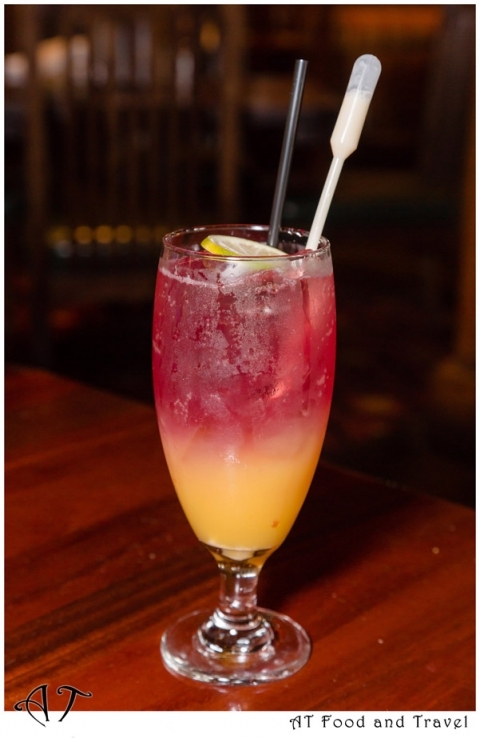 How pretty is this Jamaican Lemonade? Wait until you taste it! I loved that it was not overly sweet or tart. In another word, it was PERFECT! 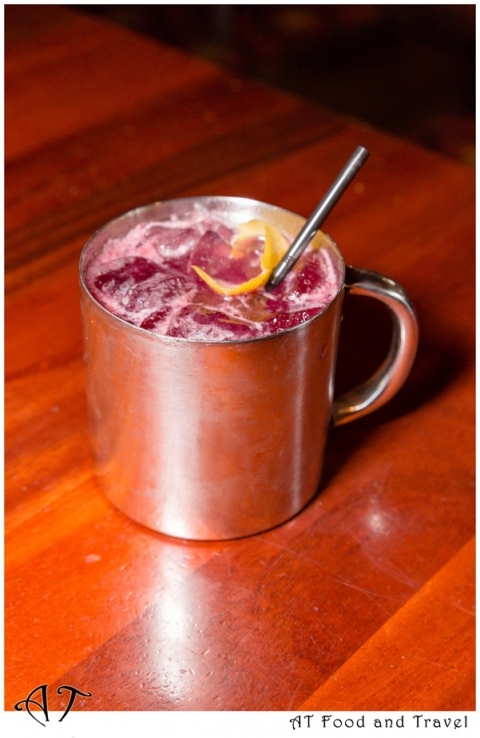 A friend told me I had to get the Huckleberry Mule, so of course I obliged. You like Ahi Poke Bowl? Well, try this Ahi Poke Jar. Tender pieces of sashimi grade ahi tuna (peanut vinaigrette, avocado, pickled cucumbers, wasabi dressing, wonton chips) is a perfect starter! Street Corn ( lime, garlic, queso blanco, tajin, and cilantro) is another crowd pleaser. I could eat this whole plate by myself! Our server highly recommended Cucumber Thyme Lemonade and it didn’t disappoint. You really can’t go wrong with any of them. When Allen sees ‘BURGERS’ on a menu, he could not resist! He is such a burger lover but it has to be good though. He absolutely loved the BBQ Ranch Bacon Burger (grilled half-pound beef patty, smoked bacon, cheddar, chipotle ranch, lettuce, tomato, pickle, red onion). He chose Onion Rings instead of fries. They were big and crispy. So good! I was intrigued by the Ginger Soy Salmon (sweet soy glaze, stir-fried vegetables, sesame seeds, green onions, steamed rice). To be honest, I was a little curious. One bite of it, I was all smiles. The fish was cooked perfectly, tender and moist. The vegetables were nice and snappy. I highly recommend it if you like seafood. You want pizza? They’ve got it, too. We got the Tree Cheese (tomato sauce, Parmesan, Romano, mozzarella, basil) with pepperoni added. Who doesn’t like pizza? There are many dessert selections and we could not pass on this Simms Family S’more (chocolate fudge, graham cracker crust,warm brownie, fire-roasted marshmallow). Can I just say this is what heaven tastes like? If you are a regular patron, you know exactly how delicious the food and how friendly the services are! If you have not been or it’s been awhile since you’ve visited. It’s time to go treat yourself some good food and enjoy a resort relaxation without having to escape to the mountains! There are many locations through out California as well Colorado, Nevada and Texas. Find the location nearest you here. Check out the Bar and Happy Hour menu as well. Let me know what your favorites are, will you? Disclosure: No monetary compensation was received for this post. I was an invited guest to the restaurant to help facilitate this review. All opinions are my own.